I had this brilliant idea that the kids and I were going to make a spider mobile My idea was to use a paper plate with wool hanging down attached to spiders who were climbing down. 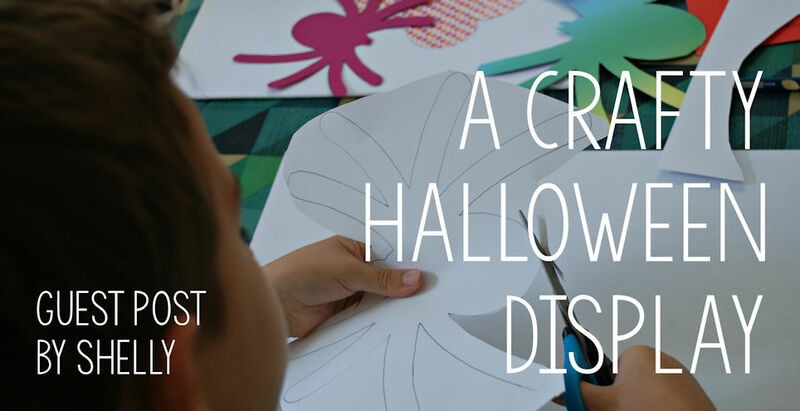 I was convinced my spider-mad son would love the idea but as often happens when you are crafting with two kids your ideas and their ideas do not always match. For whatever reason both of mine were not interested in making mobiles but they wanted to create some Halloween decorations for our windows. We stuck to using our much loved templates that we had already cut out and the kids traced around them. Because the kids were going for a Halloween effect they stuck mostly to the cat template, spider template and bat template. We have used and re-used our templates in numerous projects so I always print them out on card; they can last longer and we always print out the different sizes for each animal to give variety. I love using templates with my kids because they always end up making so many in one sitting which means lots of tracing, cutting and decorating without them getting bored. It really is such an easy crafting activity. For decorating, my son mainly stuck to stickers and puffy paint. Decorated spiders - looking fabulous! My daughter tried to make a few dimensional animals. For this you need to use the same size template to create 2 different cut-outs. You could stick to the same colour for both cut-outs or you could try different colours. Then you are going to stick the middle of the top bat onto the middle of the bottom bat – it helps if you first fold the wings before you glue them together. I really liked this effect with the bat as it gives the impression that it is flying. We thought it looked really effective stuck up on our window so we actually ended up making quite a few of them. Our 3d bats flying in the window! My daughter also tried to create a dimensional spider but she was not that happy with the end result. I actually think her dimensional spider would work really well in a spider mobile and possibly might be effective if we used a slightly lighter colour for the top spider. The kids initially decided to use their creations to decorate the windows in their play area. We just stuck them onto the window using sticky tack. But after just a few hours they decided that we needed to move their decorations to the front door so that everyone could see them. They stuck a number of the items onto the window next to the front door and onto the door itself. My son actually declared that we did not have enough spiders and has said he is going to make more spiders this coming week so the entire door is covered! Spiders on the front door! This glow in the dark spider web craft is a great way to use up your glow in the dark loom bands this Halloween! We used a variety of Halloween cupcake cases for this Halloween spider web craft and the effect was great - you can see how much fun they look in the window!